Nestled at the foot of John A. Roebling’s Covington-Cincinnati suspension bridge, in the shadows of RiverCenter and the Ascent, and rising from river banks is the Historic Licking Riverside neighborhood. Designated as a National Register District in 1975 and one of the ten best neighborhoods in the United States by the American Planning Association in 2014. It is Covington’s oldest neighborhood and the area is noted for its vibrant population, stately architecture, streetside dining, city views and river walks. As Covington is the gateway to the South, Liking Riverside is the gateway to Covington and Kenton county. This pioneering neighborhood is anchored to the south by the grounds of the Baker Hunt Art and Cultural Center and reaches to “the Point” at the confluence of the Ohio and Licking rivers. Its streets are lined by Greek Revival, Federal, Queen Anne, High Victorian Gothic, Italianate, French Second Empire and Craftsman structures, which are fine examples of the late 19th and early 20th century homes of Covington’s earliest settlers. A lovely mix of rowhouses, bungalows and multi-unit housing are neatly blended into the neighborhood’s tree-lined streets. Several restaurants, including Blinkers, Keystone Grill, Smoke Justis and Molly Malone’s provide al fresco dining to neighborhood residents and visitors alike. 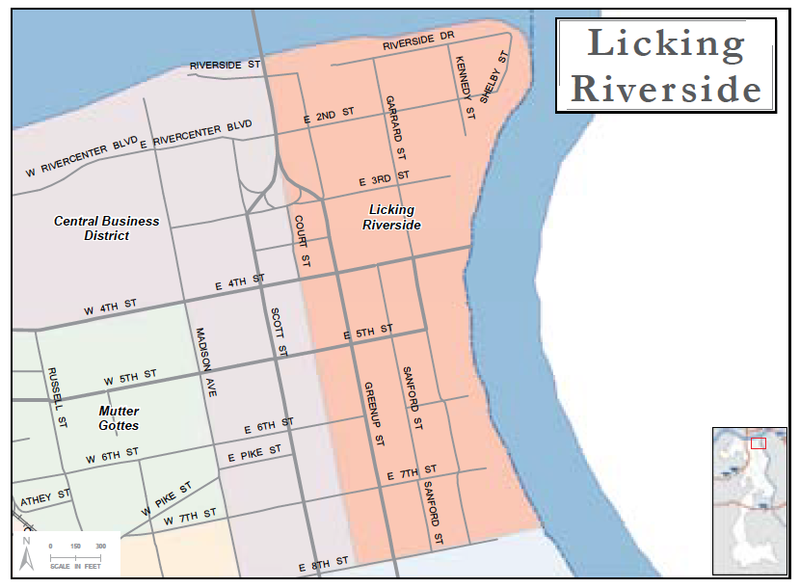 An active neighborhood association, the Historic Licking Riverside Civic Association, works cooperatively with the city to beautify the area and maintain it historic integrity. George Rogers Clark Park provides a peaceful place to watch the river, listen to sounds of ballgames and is the site of weddings and community events.